Click the red arrows for details of the stages. Click the beds for accommodation information. 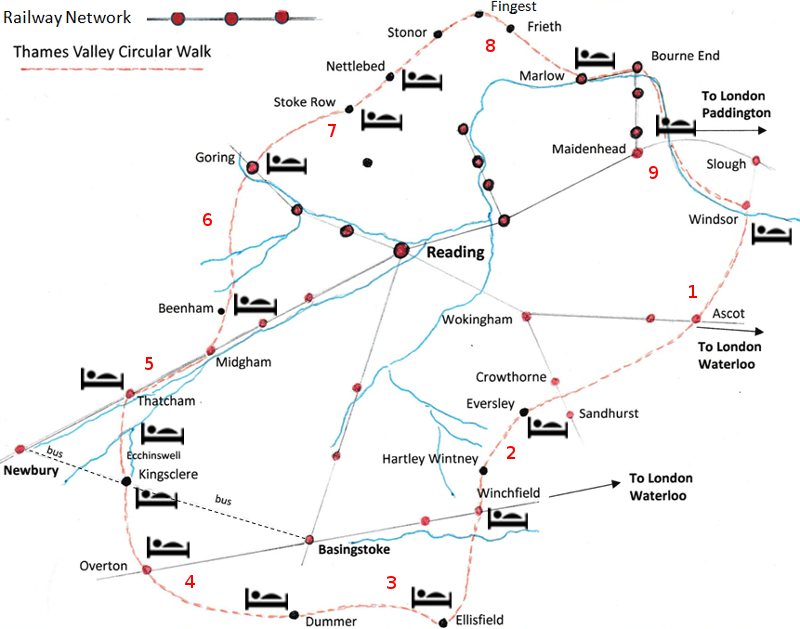 Approximately 125 miles long, this circular long distance path has access points that are easily reached by train from London, Reading and adjoining stations. If time is limited it can be walked in sections at weekends and bank holidays with one or two overnight stops. The walk passes through a variety of beautiful countryside including river valleys, chalk downland, coniferous forests, rare heath, and beech woods that are carpeted with bluebells in spring. The Thames Valley Circular Walk is not way-marked although it sometimes shares rights of way with other long distance paths. The walk mostly follows footpaths and bridle-ways, linked together by quiet lanes. Accommodation is available sporadically along the walk and at the end of each section. The farthest that needs to be covered in a day is about 12 miles. The terrain is not difficult although there are some steep, hilly sections, and care needs to be taken with map-reading in some places.